Spring is here and so is your farm fresh food. Beginning April 9th, Tazza D’Oro will be a pick-up location for Penn’s Corner Farm Alliance CSA members who have signed up for a Highland Park pick-up. At last count, Neil tells me we are at 25-30 members and counting. You guys rock! The CSA pick-up will run for 30 weeks, ending October 29th. Please check to make sure what you have signed up for – either the 10, 20 or 30 weeks. Here’s the info: Your boxes will be available for pick-up every Wednesday from 3:30 pm until 8:00 pm. Any boxes left after 8 pm will be donated, so please be on time and sorry, no exceptions. The boxes that contain your produce are interchangeable so it doesn’t matter which one you take, just bring back your empty box from the previous week and pick up your new box. Click here for directions to Tazza D’Oro. For those of you who aren’t familiar with a CSA – CSA is Community Supported Agriculture. 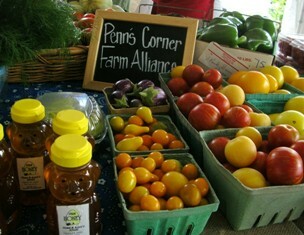 You can purchase memberships from Penn’s Corner Farm Alliance (click here) to get fresh, locally grown or raised food. Tazza D’Oro has been purchasing fresh food (eggs, honey, fruit, veggies, ham, beef and pork) from Penn’s Corner since January and our experience has been tremendous; even better, the response from our customers has been equally tremendous. In fact, we can’t seem to keep up with the ordering – even though we order more each week we continue to fall short of the farm menu items. We will just keep tweaking until we get the ordering tuned just right to your response. When you purchase from a local small business like Penn’s Corner Farm Alliance (or Tazza D’Oro or Turner Dairy) you are purchasing from a community stakeholder. A stakeholder is someone who invests in a community – they seek opportunity and fill a gap in their community, they enhance local quality of life, they invest much of their own money and sweat equity, they are committed for the long term and stay committed because everything is on the line. So, buy local!! !